This page is being updated… stay tuned! March 2014. Jake Geppert is a local musician from Bondville, Vermont. He created The Goat Jumpers, a local rock band in the 90’s, and has played with Crazy Maggy, an Irish rock band out of Massachusetts. He’s best known for his popular bluegrass band, The Bondville Boys, where he’s been playing banjo, guitar, writing songs and singing vocals for the last 20+ years. Jake recently created Beyond Further, an acoustic rock/jam band. Jake has recorded with several artists, including the Bondville Boys and Beyond Further, and he is currently working on his third CD .He also is a music teacher offering private lessons and has taught at the Mountain School in Winhall Vt.
Christian Heins, a.k.a. Natureman, has gravitated to the bass since he took two strings off of his first cheap guitar with action so high it cut fingers to play them. Largely self-taught, he became expert at “dropping the needle” to learn his favorite bass parts of Jack Bruce, Noel Redding and Sir Paul McCartney. After high school Chris landed a full time gig with the NEW DREAM, performing covers all over Manhattan and Long Island. Sanity kicked in around 1972 and attendance at the New York State Ranger School led to a 30-year career in environmental science with WOODLAND SERVICES, INC. and a home in Vermont. Throughout the years he kept the gear and in the 90’s broke out the ax to join the VERMONT BLUES PROJECT. After the BLUES PROJECT, he joined with Josh and David Wien, Jeff Marchetti and Michelle Williams in BIG MONEY, his favorite cover band experience. In recent years Chris has attended Jerald Vesley’s Bass Boot camp and several of Victor Wooten’s Bass/Nature camps to study with the world’s best teaching bassists. Nate Sherman is the newest member and drummer of the band. He’s from Bennington Vermont and keeps a good beat – he rocks! Stay tuned for a full bio about Nate. Chris met Neil Jacobson as a client of WOODLAND SERVICES. He met Jake through Neil and found something special about Jake’s original songs, “They portray things we all experience in basic terms. They mean something, a rarity today,” says Chris. 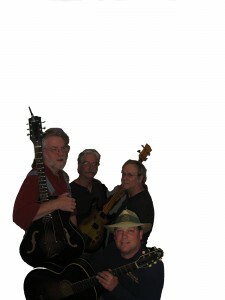 In 2004 Jake, Chris and Neil formed the Jake Geppert trio and started performing locally. Now 5 years later, with the addition of some backbone supplied by Gary, BEYOND FURTHER was born to give credit to the purpose of the band and the contribution of its membership. BEYOND FURTHER seeks to explore many paths and use their collective talents to venture beyond the ordinary.